The Ontario government's recent planning initiative, titled Places to Grow, is intended to promote higher-density development, a lower rate of urban land absorption, and increased public transit use in the Greater Golden Horseshoe (GGH), an extended area centred on Toronto. The designation of 24 Urban Growth Centres (UGCs) is a major plank of this strategy. The centres are defined as mixed-use, high-density, and public-transit oriented developments, which are meant to become focal points within the GGH. It is in UGCs, therefore, that one would expect land use formulas that promote intensification and public-transit use objectives to be deployed to the fullest extent. This report recommends measures to help establish and develop UGCs and ensure that they meet their planning objectives. To this end, it begins by reviewing the history of nodal planning in the Toronto region, a history that dates back to the 1950s. This history reveals a persistent interest in this form of development, as well as, to a lesser extent, in corridors. This interest, however, far outstrips the actual creation of nodes and corridors. Of the numerous nodes that have been designated by various planning agencies, only a few have taken shape and only four have achieved substantial levels of development. The report also analyses several study areas -- downtowns and nodes -- that are included within the UGC strategy as well as two transit corridors. The survey looks at the density, land use, travel patterns, employment trends, and demographic changes of the study areas, and the socioeconomic profile of their residents. It highlights the achievements of these existing high-density and mixed-use areas, as well as the difficulties they confront. The study of existing downtowns, nodes, and corridors demonstrates the possibility of achieving mixed-use and high-density nodal development in suburban settings. It also points to the ability of nodes to attract a mixture of jobs many belonging to high-status occupations findings also underscore profound differences between study areas. For example, statistics on the socioeconomic status of residents reveal a divergence between a wealthier population living in inner-city study areas households, high-status occupations, and high levels of educational attainment - house-households, lower-status occupations, and lower educational levels. The downtowns, nodes, and corridors selected for this study have all encountered problems in meeting certain planning objectives. One problem is the difficulty in attracting office employment during the last 15 years, an outcome of widespread deceleration in office growth and office developers' preference for low-density suburban sites. Another difficulty, particularly noticeable in suburban nodes and small downtowns, is a high dependence on the automobile at the expense of public transit use and walking. This problem is associated with an urban form primarily tailored to the automobile and ill-suited to walking. In these circumstances, it is difficult to achieve inter-functional synergy activities benefit from the presence of nearby complementary functions. The lack of frequent or convenient public transit services between many of the nodes and their catchment areas is also responsible for a high reliance on the car for journeys to and from these nodes. The planning of UGCs should be closely coordinated to ensure consistency at the macro scale (the role of UGCs at the metropolitan level), meso scale (relations between UGCs and their catchment areas), and micro scale (the layout and design of UGCs). Such an approach would ensure that efforts at all scales of planning contribute to the further development of UGCs and the achievement of their planning goals. The report acknowledges anticipated difficulties in securing collaboration on these matters, given the different jurisdictions responsible for different planning scales. 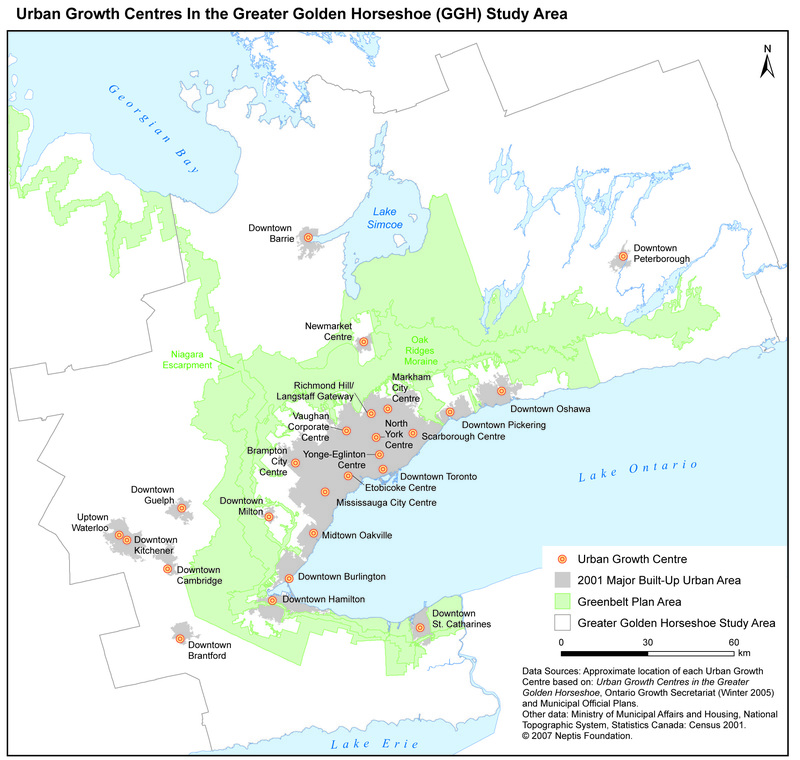 Attention should be given to the different nature of the areas intended to become cores of UGCs, or part of these cores: nodes that are the outcome of urban redevelopment; existing suburban nodes originally developed on greenfield sites; future suburban nodes to be erected on greenfield sites; traditional downtowns of suburban municipalities within, or close to, the Toronto urban perimeter; and the downtowns of self-standing urban areas within the GGH. Each category requires a specific planning treatment, ruling out a one-si*e-fits-all approach to the planning of UGCs. Measures should be taken to direct new office buildings to areas (such as downtowns, nodes, and corridors) well served by transit services. Such an office location policy would counter the present trend towards dispersed suburban office locations, which is a major factor in the increasing reliance on the car for commuting. 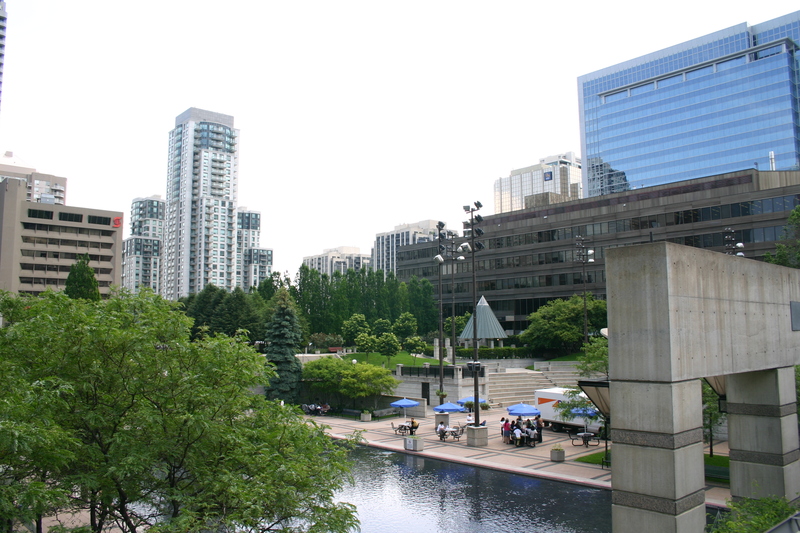 It would also favour downtowns, nodes, and corridors (and by extension, the core areas of UGCs), where office space is important to their public transit orientation and (along with retailing, hospitality, housing, cultural amenities, public-sector services, and other activities) to their mixed-use character. A hard copy of the publication may be purchased for 40 CAD (plus shipping & handling charges). Please contact publications (at) neptis (dot) org for more details.